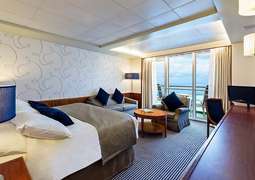 Columbus offers a wide choice of well-appointed Inside cabins, Outside Cabins, 28 Deluxe Balcony Cabins and 36 Junior Balcony Suites. 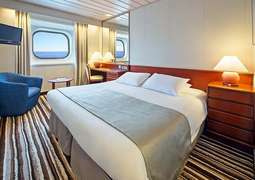 All accommodation is graded according to size and/or position within the ship. The cabin steward will ensure a high degree of service throughout your time on board. 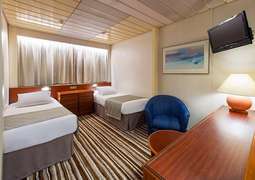 Every type of cabin includes its own modern design which one can expect comfort and luxury from. 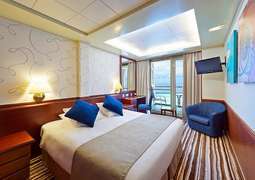 While cruising on the Columbus you have a variety of different restaurants to indulge in once on board. At the Waterfront Restaurant you can enjoy a full English breakfast, savour a leisurely lunch and enjoy a delightful five course dinner. All meals are usually served on an open seat basis however, two fixed time sittings are operated for dinner. Dine at the Fusion or Grill speciality restaurants for exquisite food or sample the delights of a sumptuous dinner at the ‘Chef’s Table'. The Plantation Bistro has a more casual atmosphere it is open every day for buffet style breakfast, lunch and dinner. While the Alfresco Grill is on when the weather is fine so one can relax, enjoy the sun and experience an amazing view. Columbus offers a choice of several different lounges and bars including Captains Club, Raffles and Taverners Pub. Each bar has its own individual atmosphere for you to choose from. Columbus offers two speciality coffee and tea shops on board. As the Columbus has spacious surroundings means there is always a quiet corner to relax. Columbus offers great onboard entertainment, from show teams to pianists to disco. The atmosphere on board is ideal for enjoying guest speakers, entertainers and craft specialists. If you love comedy Columbus has just the thing for you with 'A Laugh on the Ocean Waves' enjoy incredible comedy acts all evening. Enjoy night music as this ship offers a combination of different styles of music. Activities on the Columbus are endless. Enjoy chilling by the pool or get a make-over in the beauty salon. Every day there is deck games on board or if you prefer you can challenge yourself there is a table quizzes on offer.